SCENE: A wooden stage, looking very real and solid, amid swirls of yellow-green smoke or fog. On the stage three women sit on wooden stools, beside a painted hearth. A beautiful maiden spins the thread, a strong matron measures it, and a wrinkled crone cuts it with a pair of golden shears. A man appears at the edge of the stage. He’s a middle-aged man who looks insignificant, with his receding hair- line and dark curls that brush the shoulders of his cheap russet wool suit. Only his eyes, sharp and intent, golden as a bird of prey’s, hint at curiosity and intelligence. He walks to the center of the stage and faces the women. Will does not know if he dreams or wakes. He walks on a creaking stage with hesitant steps and knows not how he got here. Only minutes ago he slept in his own bed, in his rented room in London. By what magic has he been brought hence? Three strange women face him. Women they look to be, women they seem to be, and yet something about them proclaims them something else. Will jumps back, shocked both at deformity and greeting. Great poet? Did she indeed greet Will thus? He could scant believe it for he knew that his poetical talent was as yet all dreams and none of it survived the harsh light of reality. “All hail Will, whose verse generations yet unborn shall recite.” The matron looks up from the thread she winds and measures. Her smile shows feral, serrated teeth. Scared, Will takes three steps back. This is a mocking dream that thus torments him with the possibility of his dearest hopes. He takes his hand to his collar and seeks to loosen it, as though by breathing deeply he might regain his footing in real life and the waking world. “By us is all life threaded and measured and cut, ours the weaving of human fate,” the matron says. “But ours will be the undoing and the death, should we not find a champion to defend us.” The crone’s hair flies wild, framing her face in snow-white tendrils. “The kingdom of elves is in turmoil and the disarray of that sphere threatens ours. 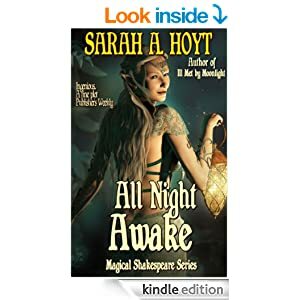 Sylvanus, who should be the Hunter’s slave, plots to rebel against his master, who, like us, is an ancient and powerful invention of humanity, an element and avatar of all that’s justice in males,” the matron says. “Sylvanus, who was king of elves, and for his foul deeds was enslaved to the Hunter, the justiciar, the provider,” the crone says. “Why do not you stop him yourselves?” Will asks. He vanishes like smoke upon the stage, leaving the three women behind, spinning and cutting and measuring the eery thread that glimmers white in their laps. Will Shakespeare looked at the Si Quis notices posted on the door. There were so many that one was glued upon the other, till the whole door appeared to be made of paper. Si Quis meant if anyone. Si Quis would be tailor, Si Quis would be serving man, Si Quis would be fencing master. All the jobs in London were spread before Will, like the countries of the earth before the tempting devil. Yet Will remained unemployed, his stomach empty, his rent long overdue. Only an hour ago, Will’s landlord had awakened Will from uneasy, fitful sleep to demand payment for lodging that he’d long occupied but not paid for. Another day, and Will would have no lodging, either. Si Quis would be chimney sweep. Si Quis would be gardener. All these professions, though many, were to Will’s purpose none. His head hurt with a thunderous headache, and clotted remains of his dreams haunted his mind. A great poet, the creatures had said Will would be. A middle-aged man, with fading looks, a provincial grammar-school education, and next to no friends in London, Will felt as though his fortune were as out at heel as his suit and his frayed lace cuffs. No one wanted a would-be poet. No one was looking for an aspiring playwright. No one craved to hire even someone with Will’s other, meager abilities: a petty schoolteacher, or a glover with little more than apprentice skill. A chimney sweep advertising his services. The smell of roasting meat, seasoned with nutmeg and ginger, drifted up to Will’s nose, tantalizing his stomach with savors of a supper he couldn’t afford. Will dearly wished someone would invite him to sup. But in his six months in London, he’d formed near to no acquaintance and been befriended by none. He’d been cozened and fooled and stolen from. He’d been duped and mocked and betrayed, but he’d formed no useful connection, no gentle friendship that might ease his penury. The little money he’d brought to London with him—scraped together from his father’s failing business and his wife’s selling of homegrown vegetables—had fallen drop by drop into an empty barrel of despair from which the sweet wine of hope had long since evaporated. Now he had nothing. Not money enough to buy supper, not even enough to return home. Nothing was left to him but to walk to Stratford, which would take days. Will would starve long before that. Tears prickled behind Will’s eyelids. How confident Will’s wife had been, his Nan, when she’d pressed the few coins of their meager savings into Will’s sweaty hand before he left home. She’d kissed Will and told him that with his words and his wit he could pry London open like a treasure coffer, and make his fortune and the fortune of his whole family. Oh, deceived wife. Oh, poor, way-led woman who—despite having lived with Will for ten years and borne him two daughters and a son—still believed her man to be a Hyperion, a sage, the form and glass of all mankind. Poor Nan, who would never even know that her husband had starved in London, dead of his own folly and inflated pride. Behind Will men swarmed and pushed around the Si Quis door. Some were dressed as poorly as he, others arrayed in fine silks and velvets. All, by Will’s side and pressing, shoulder on shoulder against him, read the notices on the door with the kind of hunger for employment that bespeaks the specter of starvation nearby. Each made a little triumphant noise or read the words aloud when he found a likely position and then tore off the sheet and sauntered away. A man in a sky blue doublet, three finger-widths of creamy lace peeking from beneath his sleeves to shroud his hands, put a well-tended finger on the paper asking for a fencing master, and pushed Will out of the way to tear the sheet off the door. It was no use, Will thought, jostled and pushed, feeling lost and hopeless. He would go back to his lodgings and dream for his supper while he starved. In his dreams he’d been a poet, but waking no such matter. His gaze swept over the yellowed papers and the crisp white ones, perusing the words scrawled upon them with desperate longing. Si Quis would be smith. Si Quis would be weaver. Si Quis would be horse holder outside the bear garden. Will’s breath arrested. Wait. He could do that. He put his finger on the paper. He could look after horses for customers who went inside to watch the bear baiting. He grasped the corner of the sheet, meaning to tear it out and follow instructions on how to apply for the job. Looking over his shoulder, Will saw a blond man as threadbare as himself. He looked back at Will and smiled, disarmingly. “Though, for my money, I’d rather have been an actor.” He grimaced as though he’d named the lowest profession he could think of. Will sighed. “I came to London to be a playwright,” he said. In a moment, Will let go of the paper and turned, the thought of a job vanishing from his mind. The idea of holding horses in front of the bear garden became abhorrent, as did the idea of any job not in the theater. As abhorrent as stale beer when fresh wine is offered. If Philip Henslowe was the owner of The Rose, in Southwark, then Henslowe was the owner of the largest and most successful theater in London. In The Rose were enacted Kit Marlowe’s plays, the most acclaimed shows of the age. Even in far-off Stratford-upon-Avon Will had heard of Tamburlaine the Great and, with trembling admiration, read its lines printed on the cheap paper of a hastily copied booklet. All his dreams reviving, Will thought that if only he could meet Henslowe, if he could impress Henslowe—why, Will would conquer the theater and become as great as Marlowe, and perhaps greater. He blushed at the hope, which he would never dare voice, even as it beat madly in his shying heart like a bird imprisoned in a glass dome. The man in the red doublet and green hose stood in the center of the nave, right in the middle of Paul’s Walk, talking to an auburn-haired dandy in a dark velvet doublet slashed through to show flame-colored fabric beneath. The dandy didn’t matter, but Philip Henslowe did. In six months, Will had yet to meet someone as important in the theater. This could be the turning point of his luck that led to the fulfillment of all his hopes. Now he would brave Henslowe on his own, with no introduction. Or, Will thought, clenching his fists while his lower lip curled in disdain, Will deserved no better work than to hold horses in front of the bear garden. Will elbowed the surrounding men out of the way, cut through the middle of a group of loudly arguing dandies, and extending his hand, as though to beg, charged toward Henslowe. At that, all of Will’s wit fled him and he stood, mute and frozen, before the theater owner. Will wanted to say that he would like to write plays, that he was sure he could write plays as fire-woven as Marlowe’s, or better. But he could say no more. Up close, Henslowe looked older than Will had expected, his face as suntanned and worry-creased as the face of Will’s wife, back in Stratford. Will’s mouth opened, but his tongue could not find the turn of a rounded phrase or even the trick of a single word. Philip Henslowe looked average: a man with brown eyes and longish, straight brown hair. His bold-colored doublet and bright green pants showed as much sign of wear as Will’s russet suit. At elbows and knees, the fabric had worn old and thin, all the pile gone and nothing but the threadbare weave beneath. He looked back at Will with lusterless eyes and arched his eyebrows. “A poet?” he said, as though the word were a fantastical sound referring to some obscure occupation or some marvel told by sailors returned from distant lands. Henslowe looked at the ceiling, as though beseeching a far-off divinity. Will’s mouth remained dry. He shook his head. Who could this be, whose clothing looked newly made, whose auburn hair showed the darker roots that indicated art aiding nature, whose every trait and feature betrayed a nobleman? Why would such a one talk to a theater owner, the impious rabble of society? And why would such a one bother to mock Will? “Ah, he busies himself with the egg and flour of tanning, does he? And was it at his foot that you learned the fine chervil leather of a couplet, the whiting of poetry?” The gentleman smiled. Henslowe rolled his eyes in silence. The dandy laughed and turned to Will with sudden, giddy enthusiasm, “So, say a poem for us. A poem.” He stuffed his handkerchief back into his sleeve and stepped back, as if to make room for Will’s expansive wit. “Declaim,” the dandy said, and waved a hand encased in pearly grey chervil gloves with a heavy golden fringe at the end that dangled over a dainty wrist. Will glanced at Henslowe, who stared not at Will but at the other man, with something like wonder or alarm. Would Henslowe listen? Could Will earn his place as a playwright this way? Standing with his feet close, Will cleared his throat. When he’d dreamed of a moment like this, he’d imagined a tiring room, the air thick with the smell of grease paint, the actors all bespelled by Will’s very presence. A theater owner, or perhaps even a nobleman, would ask Will to recite a poem and all the actors would fall silent, all movement stop, till, in the end, nothing stirred amid props and costumes, nothing moved except Will’s voice rising and falling and dazzling all. But Will’s reality always fell short of his dreams, and therefore, he cleared his throat and made to start. “I have Dutch coins, and German, and French too. Change your coins here, before you set abroad,” a money changer yelled near Will’s ear. Will jumped, but his would-be listeners didn’t move. The dandy looked attentive, the theater owner bored. His voice shaking, Will started, in measured cadences, to speak his best sonnet. It was the one he’d written for Nan when they were courting, the one that ended in hate from hate away she threw / And saved my life, saying not you. When Will had finished, the noise of Paul’s had not died down. From somewhere came the high-pitched laughter of a bawd, and somewhere behind Will two gentlemen argued loudly. And the dandy, his eyebrows more arched than ever, looked puzzled. “A fine sonnet, to be sure,” he told Will. “A fine sonnet.” Despite the man’s words, his lips worked in and out, battling some emotion that Will feared was mirth. The small, neat mouth—whose corners trembled upward, beneath the narrow moustache, when Will addressed its owner as “lordship”—opened in a round “o” of astonishment. “Ah. Hathaway. Hate from hate away. Why it’s marvelous, man. No more than a poet in two would think of such a clever pun, I say. What say you, Henslowe?” He turned to the theater owner. Suspecting he was being mocked and feeling his heart droop down to consort with his worn-out boots, Will, too, turned toward the theater owner. In Will’s brain the given name of Kit added to Henslowe’s request for a new play, and to the name of Faustus, and as Will turned to gaze on the dandy—Will’s mouth opening in wonder, his eyes wide—he realized that this creature, with his slashed-through sleeves, his immaculate, white silk hose, his expensive boots, his lace handkerchief, and gold-fringed grey gloves was no other than Kit Marlowe, the leading playwright of the age, the Muses’ darling, the light of the London stage. The playhouse owner patted Marlowe on the shoulder, as if acknowledging a joke or thanking Marlowe for a favor. “But pray what did you think of my poem?” Will asked. His voice, strangled and small, did not carry very far and missed Philip Henslowe altogether, as the theater owner turned his back and disappeared amid the throng. “He didn’t listen to your poem,” Marlowe said and smiled at Will as though this too were droll. Will’s stomach twisted in hunger. Did Marlowe not understand that this was Will’s very life in the balance of the theater owner’s attention? Will’s mouth went dry again. Marlowe, who had translated Ovid’s Amores, asked if Will knew the classics. Even the Amores, Will had read in translation. “I have little Latin and small Greek,” he stammered. “But my lodging—” Will started, intending to explain that he was already overdue in paying for that and must make some coin or perish. “Your lodging is not convenient to gentlemen’s abodes?” Marlowe asked. But before he could speak, two men emerged from the crowd, like wrathful gods from stormy waters, pushing aside money changers, ballad makers, and smirking, tightly corseted bawds. The men flanked Marlowe, one on either side. Will stepped away from them. Somberly dressed, in black with no adornments, the two men looked like Puritans. They were not the sort of men that Will expected to see with a playwright. Marlowe looked at one, then the other. His whole face contracted, aged, soured, as if he’d tasted bitter gall. One of the men had narrow-faced, thin looks that reminded Will of a rat in a house with a fast cat. The other one was round, but old, his face wrinkled and his chin sporting only a dismal growth of beard, like grass striving to thrive on poisoned land. Will expected Marlowe to dismiss them or make fun of them. “If you would come with us,” the small one said, his voice echoing with an incongruous boom. Marlowe smiled, an oddly forced smile that lacked the mobility of his amusement and the malicious quickness of his teasing. It looked like the grin of a death mask, like the drawn lips and vacant eyes of a final rictus. Funny how, when people died like that, their neighbors said they’d gone to their reward smiling. Will would never believe it again. The three of them walked off, the two men on either side, hemming in Marlowe. Despite Marlowe’s smile, his easy walk, he looked like a prisoner led to the gallows. Will stared after them, blinking. It couldn’t be. What would a playwright be arrested for? His writings? No. The Queen’s censor approved all plays, did he not? So, how could something libelous get on the stage? No. Those men must be Kit Marlowe’s friends, and Will’s foreboding the fruit of his own sick thoughts. Hunger gnawed at his entrails like a sharp-toothed rat, and all dreams of work in the theater had vanished before Will’s eyes like a lacy fog that—lifted—uncovers dismal reality. He rubbed his calloused thumb and forefinger across his eyes, trying to thus remove the veil that tiredness and faintness dropped in front of his vision. Earlier that afternoon, to evade his hunger, Will had taken a nap. In that sleep, a strange dream had visited him, a dream of womenlike beings, who’d hailed Will as a great poet and forecast such a great future for him. In this, his dismal waking reality, such dreams must be dismissed with a smile and a shrug. But tears prickled hard behind his eyes at the loss of that dreamed greatness that had never been his. He retraced his steps through the thronging multitude, past a woman selling grilled chicken meat, to the Si Quis door again. But the notice for the horse holder job was gone, as was the man who’d pointed Henslowe out to Will. Will would find no work in London. He was too simple a man for this town. In Stratford, respectable men were honorable and people acted as they seemed. Nothing had prepared Will for the widespread deception he’d found in the capital. Each day in London, it seemed, Will had been ill used by someone. His purse had been cut, his meat begged away from him, his bread shorted, his room overcharged for. Yet, he could go nowhere else. He lacked the money. He might as well return to his lodgings. If he were lucky, his pious Protestant landlord would already have gone to bed and would not demand the rent that Will could not pay. Thus, Will would have a bed for yet another night. A postponing of the harsh fate he could not avoid forever.